'Rajnikanth' the name itself is enough. You may have seen him make you cry,smile and laugh with his funny gestures and acts.I would love to say that this evergreen superstar has impressed me with his acts.I can proudly say that he is my favourite actor.The talent this guy possess is appreciable and its significant to say that this guy actually rocks.I actually wrote this post because there is some reason behind this.Our superstar is celebrating his 60th birthday today.He is old but who cares until he is entertaining people. People in TN are crazy behind him.They are big Rajni freaks. 'Rajnism' is the term which is associated with absurdity in most cases.He makes things possible.I have written 2 posts about our great superstar.But I've made mockery of him in those two posts. But I can assure you that this post will see something similar. Let me tell you some historical facts and few things about this great person. 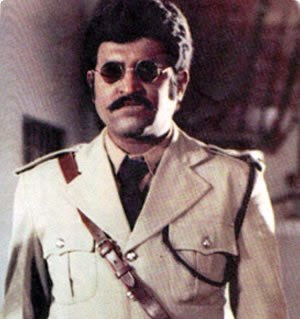 Rajni unlike other actors was not rich and ambitious.He was born in a poor farmers family and there was a time when the family struggled for its basic requirements such as food and all. He was struggling during his initial phases of life. He came to Bangalore with few dreams.Before that he worked a carpenter and later switched on to work as a coolie. Despite of suffering various backdrops in life he never gave up.Its his confidence and courage which stood front.He served as a conductor for public buses in Bangalore.Life was miserable until he met Balachander.He was the first to introduce him in a movie and the movie was blockbuster hit.He started his career as villain,anti hero and supporting actor.Later on he turned into a full fledged actor and would produce blockbuster hits.Even today his movies would surpass his previous records.People in TN praise him like almighty and he is no less that god to them. The one thing I like about this Superstar is that although he may be rich and famous today, he is simple.He likes the way he is. 'Simplicity' is something which is one of this character.We get to learn a lot from him.He is the evergreen superstar and I'm glad that I am one of his fan.Once again I would like to wish him a very happy birthday.May he live long and god may shower all his blessings upon him.I'm sure he will act as a hero during his 80's and we all will enjoy it for sure. Thanks a lot O Super star for entertaining us for these 25 years and taking tamil cinema to great heights.Happy birthday to Yuvraj Singh as well and Wishes to Pooja Chopra who is representing India at the beauty contest. Umm!! so enough of Rajni praises .Now its time for some fun.Continuing from my previous two posts. 1.Outer space exists because its afraid to be on the planet where Rajnikant lives. 2.Rajnikant has counted to infinity twice. 3.When Rajnikant does push ups ,he isn't lifting himself up ,he is instead pushing earth down. 4.Rajnikant is so fast,he can run around the world and push himself in the back of the head. 5.Rajnikant never wears watch,he decides what time it is. 6.Rajnikant gave mona lisa that smile. 7.Rajnikant can slam a revolving door. 8.Rajnikant's house has no doors, only walls that he walks through. 9. Rajnikant grinds the coffee with his teeth and boils the water with his own rage. 10.If you Google search " Rajnikant getting kicked",it generates 0 results as it doesn't happens. 11The Bermuda triangle used to be Bermuda square until he kicked off one of the corners. 12.The only thing that runs faster and longer than Rajnikant are is his films. 15.A picture is worth a thousand words. A Rajni is worth 1 billion words. 16.Newton's Third Law is wrong: Although it states that for each action, there is an equal and opposite reaction, there is no force equal in reaction to a Rajni kick. 18. Rajni can run faster than the speed of light.He can beat Usain Bolt any where. 19.Rajni invented black. In fact, he invented the entire spectrum of visible light. 20.Rajnikanth can drink an entire gallon of milk in thirty-seven seconds. 21.It takes Rajnikanth 20 minutes to watch 60 Minutes. 22.Simply by pulling on both ends,Rajnikanth can stretch diamonds back into coal. 24.Rajni is expected to win gold in every swimming competition at the 2010 Common wealth games , even though he does not swim. This is because when Rajni enters the water, the water gets out of his way and he simply walks across the pool floor. 27.Rajni can judge a book by its cover. 28.Nothing can escape the gravity of a black hole, except for Rajnikanth. He eats black holes. They taste like chicken. 29.Rajnikanth uses a night light. Not because he is afraid of the dark, but the dark is afraid of Chuck Norris. 30. Although Rajni is afraid of snakes, but snakes are his best friends too.He uses snakes instead pf his skipping ropes. 31.Rajni once kicked a horse in the chin. Its decendants are known today as Giraffes. 32.Sticks and stones may break your bones, but a Rajni glare will liquefy your kidneys. 33. When Rajni plays Monopoly, it affects the actual world economy. 34.Rajni successfully seperated twins conjoined at the head by roundkicking them in the face. 35.Rajni does not know about this Blaag. If he did he would have just deleted the internet. 36.Blogger Bandeep Salan and Rajni have one thing in common. Both are known for their craziness although the latter is better than the former. 37.People can tickle your funny bone.But Rajni breaks it. So enough of Rajni jokes. Have fun guys! I hope you had a great time reading all this .Do write your favourite one?And once again lets sing a Happy birthday song to our great superstar. "Happy Birthday O dear SuperStar!" ha ha . thats a nice tribute to him.. i wish he reads this post someday.. and i like him for his style.. Happy Bday Rajni sir! 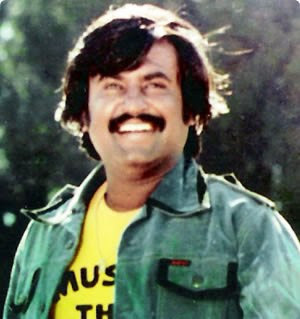 Rajni will swap the north pole with the south pole if at all 2012 disaster happens ! Rajni can divide by 0! hahaha! That did it for me! Simply a great funny post. there are people here, who totally believe all those insights! that is the power of our Superstar!! Love him! :) He Rocks!!! !